The Ames True Temper Sync-It is a outdoor water station. This item is fully assembled and includes mounting hardware, drain tube, and nozzle holder. This item is great for washing your handles, plants, fruits and vegetables. 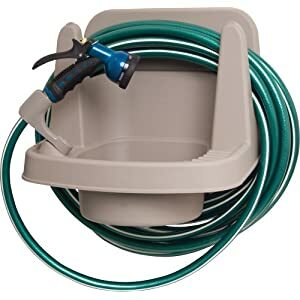 Garden sink and hose hanger. All poly construction. Can hold up to 100′ of 5 8″ hose. Wall mount. Fully assembled. Drain hose included. Nozzle holder included.